At Planvesting, everything we do – from how we price our services, to the guidance we provide our clients, to the investment strategies we recommend – is determined with a single, over-riding question in mind: “Is this the best we can do to protect the long-term interests of our clients, for the lowest reasonable cost?” It’s a standard of care that goes beyond the fiduciary standard; one that’s based on principles, rather than just the letter of the law. Often referred to as a “Stewardship” standard, it reflects our passion and commitment to always do right. Investors often assume that all financial professionals who use generic job titles such as financial planners, wealth managers, and investment advisors are mandated by U.S. security laws to act in the best interest of their clients. This is, unfortunately, not true. Most financial advisors are simply “registered representatives” (aka brokers) and, as such, are subject only to the “suitability standard”. 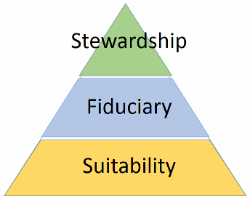 This is a relatively weak standard of care which requires only that the broker ascertain a “reasonable basis to believe that a transaction or investment strategy involving securities that they recommend is suitable.” Importantly, note that “suitability” does not set a standard for conflicts of interest, or placing the best interests of the investor ahead of the broker. In other words, a broker can satisfy the suitability “standard” by recommending the least suitable of the suitable options (as long as it falls within the general suitability test). It’s a standard that invites conflicts of interest as it relates to broker compensation: often the products that are best for the broker (i.e., those that have the highest payouts) are the worst for the investor. See, for example, Are You Being Advised or Sold To? and House of Games. Most Registered Investment Advisors charge a fee based on a percentage of Assets Under Management (AUM). Yet, AUM fees can penalize affluent investors, encourage unnecessary risk-taking and skew advisor objectivity. Rarely, however, are AUM fees disclosed as the conflict of interest that they are. Over any reasonable investment time horizon, active investment strategies tend to under-perform passive investment strategies – the objective evidence demonstrates this fact quite conclusively. Yet fiduciaries who recommend active strategies to their clients are not required to disclose this fact (and we know of none who do). Integrity – Integrity demands honesty and candor which must not be subordinated to personal gain. We will not compromise our principles for any reason! Character is at least as important as competence in the financial services industry, if not more-so. Objectivity – Objectivity requires intellectual honesty, independence and impartiality; all of which are fundamental to providing conflict-free advice. We will remain objective at at all levels of our relationship with you. Competence – Competence means attaining and maintaining an adequate level of knowledge and skill, and application of that knowledge and skill in providing services to our clients. We will endeavor to constantly increase our professional knowledge and expertise. Confidentiality – A relationship of trust and confidence with our clients can only be built upon the understanding that their information will remain confidential. Our policies and procedures have been developed to ensure that information is accessible only to those authorized to have access.